Chakra suite is the expanded incarnation of Spectrum suite, Steven's award-winning, classic recording which was recently named "the most influential New Age healing recording of all time." This landmark recording resonates each chakra with the corresponding keynote of sound which entrains your body, mind and spirit to a higher order of coherence and overall well-being. The luminous tones of the electric piano and ethereal harmonies spiral up your spine to the top of your head, making it ideal for relaxation or meditation. 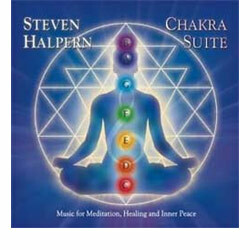 Chakra suite is the expanded incarnation of Spectrum suite, Steven's award-winning, classic recording which was recently named "the most influential New Age healing recording of all time." This landmark recording resonates each chakra with the corresponding keynote of sound which entrains your body, mind and spirit to a higher order of coherence and overall well-being. The luminous tones of the electric piano and ethereal harmonies spiral up your spine to the top of your head, making it ideal for relaxation or meditation. Each keynote of Chakra suite adds swirling harmonics and overtones that seem to deliver an extraordinary psycho-acoustic effect. Listen with headphones and you will notice that the intricate interweavings of atmospheric essences take on a 3-dimensional presence. They seem to tickle and energize the "inner ear" as well as the outer ones. Tuning and balancing the chakras is an essential key to "sound health" and spiritual well-being. For over 5,000 years, healers have known how to harness the power of these etheric energy centers, and now, you can too. All you have to do is listen. Chakra Suite works by resonating the 7 chakras with the correcponding musical keynote and scale. Helpern's award-winning masterpiece launched a "quiet revolution" in modern healing music when it was first released, and continues to set the standard of excellence in the field today. This 30th Anniversary edition has been remastered and expanded to deliver an even more exquisite and rewarding experience for body, mind and soul. Within seconds, you will feel your stress melt away as the pristine purity of Steven's legendary Rhodes electric piano and atmospheric arrangements evoke your "relaxation response." Your breathing becomes deeper, your heartbeat slower, your whole being feels lighter... It's effortless effective and enjoyable! You can heighten the healing effects by focusing on each chakra (instructions included). Superb for meditation, massage, yoga, and all healing arts, Chakra Suite is an album you'll be enjoying for years to come.